There are many tales told of King Arthur and his knights of the round table, so it would seem reasonable that someone would use this for a slot theme. Rabcat Gaming brings you Forsaken Kingdom: Path of Valour, a darker tale of King Arthur and Camelot. Play along and watch as he stands waiting impatiently at the side of the reels ready for battle. Forsaken Kingdom: Path of Valour is a 5-reel, 20 pay line slot that offers a realm stealing RTP of 96.54%. Booming music plays along as the reels spin lending a rather over the top feel to the game. So much so we had to switch it off after a little while as it was too distracting for us. Symbols include the sword in the stone, a version of King Arthur, the Black Knight, Camelot and then of course you have your very regal looking K, Q, J and 10 to make up the lower symbols. Bet Amounts – Betting on Forsaken Kingdom: Path of Valour begins at 1p per line in play and can be increased to £2 per line in play. Meaning your spins can cost anything from 1p up to the maximum of £40 per spin. Be sure you have selected the right amount of lines and cost per line before hitting spin. Wild Symbol – Lady Guinevere is your wild symbol, although she looks nothing like the Guinevere we know of old. She will only appear on reel 3 and will substitute for all other symbols except the scatter. If there is a potential win on the reels and the Guinevere wild has landed, she will expand across the whole of reel 3 in order to complete the win. Scatter Symbol – A knight’s shield is your scatter symbol in Forsaken Kingdom: Path of Valour. It will trigger not one but two of the bonus features for you, so read below to find out how. Epic Battle Bonus Feature – Triggered during the main game, this feature is a great one to bring those instant wins into your balance. Land King Arthur next to the Black Knight on the top row of the reels, to be given an instant win cash amount to your balance. Eternal Love Bonus Feature– Up there with the greatest love stories of all is that of Arthur and Guinevere. 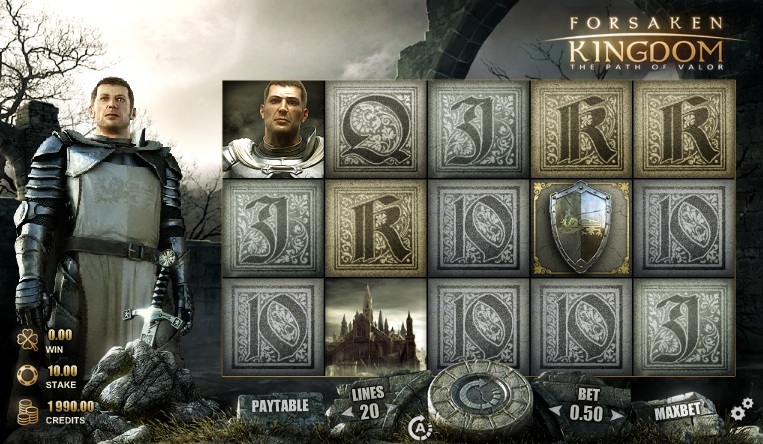 In Forsaken Kingdom: Path of Valour this love story is kept for eternity, so land King Arthur next to Guinevere on the top row of the reels to win an instant cash amount. Bonus Spins Feature – Land three or more of the shield scatter symbol to trigger the bonus spins round. King Arthur will remove the sword from the stone to the left of the screen, in doing so he will reveal your spin allocation. Spins will be awarded from the lowest of 5 to the highest of 12, unfortunately there is no extra multiplier here. However, the spins can be retriggered from within the round so keep a watch for those shields landing. Round Table Feature – Another interesting extra in Forsaken Kingdom: Path of Valour, is triggered by the shield scatter is the Round Table feature. You may have noticed that around the spin button there are 12 segments and that each time you land x2 or more shields, a segment fills up. This is your round table and the aim is to fill up all the spaces to enter the feature. Once all the spaces have been filled you will be taken to a new screen. Here you will be faced with your own round table, but each position on the table now holds a multiplier on it. The table will spin and whatever multiplier you land on is what your stake will be multiplied by and awarded as a win. Despite Forsaken Kingdom: Path of Valour taking a darker route to the story of King Arthur, it actually still played out really well. Those instant win features had nothing to do with our decision in that respect of course, but they certainly helped. Overall the game was fast paced and easy to play. The backing music combined with King Arthur cheering away on every bigger win got a bit tiresome after a while. But that was easily resolved by switching off the sound, other than that we have nothing to complain about with this slot. Rabacat Gaming have done the legend proud and we think it will appeal to all types of players, not just to those interested in the genre.